More than four years in the making, the comprehensive plan for Bushwick, a community-driven effort launched to address the neighborhood’s rapid gentrification that includes a mass rezoning scheme, was unveiled on Saturday. Released as Mayor Bill de Blasio’s administration continues to forge ahead with rezoning plans for neighborhoods across the city, the Bushwick Community Plan contains a list of policy changes intended to control new development in the neighborhood while maintaining its private housing stock, as well as addressing a variety of other issues in the neighborhood, including the creation of historic districts to preserve the character of some areas, increasing sanitation funding in major commercial corridors and improving access to healthy food. But the pièce de résistance of the community plan, and the part that has put different groups of residents and the city’s Department of City Planning at odds in terms of specifics, is a general proposal to allow high-density development along high-traffic areas like Broadway, which forms Bushwick’s southwest border, while restricting building heights along some residential side streets. For some of the residents who have been working on the plan since day one—a process that has included input from a wide swath of groups and enjoys the full-throated support of the two City Council members who represent Bushwick—there is lingering skepticism as to whether or not it will restrict Bushwick’s runaway growth or slow the tide of longtime residents getting priced out of their homes. Robert Camacho, the chair of Brooklyn Community Board 4 and a 57-year resident of Bushwick who was been working on the community plan since the beginning, concedes that rezoning the neighborhood would be no “magic bullet” to corral new development and keep low-income residents from being displaced. According to U.S. Census data contained in the community plan, Bushwick’s median household income in 2016 lagged behind incomes for New York City as a whole: it was $43,481 in Bushwick and $55,191 citywide. The average monthly rent for a one-bedroom apartment in the neighborhood in August, according to a report by MNS, was $2,323. “I want this to be the first rezoning that a community wants, not one the community fights,” said City Councilman Antonio Reynoso, addressing a crowd of about 200 who gathered at the Bushwick School for Social Justice at 400 Irving Avenue on a sunny Saturday afternoon for the release of the Bushwick Community Plan. 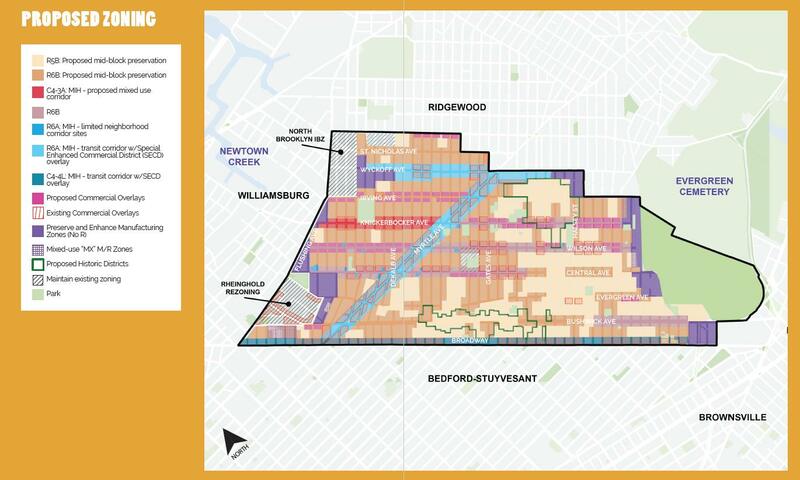 As Reynoso seemed to suggest, residents of almost any neighborhood in New York City, especially in north Brooklyn, are right to be concerned when the city starts talking about large-scale rezoning. For example, Williamsburg and Greenpoint implemented one for the East River waterfront about 13 years ago during the administration of Mayor Michael Bloomberg — since then, median income in the area jumped from $39,550 to $67,830, according to the community plan, and has become festooned with luxury high-rises that are unaffordable for many longtime residents. The causes of gentrification are complex, but the red carpet laid at the feet of developers in Bushwick is the neighborhood’s high proliferation of R6 residential zoning, a designation that allows developers construct taller buildings with a certain amount of open space at street level. The process to develop the plan began in 2013, when Community Board 4 sent Reynoso and City Councilman Rafael Espinal, who also represents Bushwick, a letter expressing concern about the out-of-character development springing up on the neighborhood’s side streets. Among the groups that came to the table to develop the plan were CB4, Brooklyn Legal Services Corporation A, Make the Road New York, Churches United for Fair Housing and others. Some of the objectives in the plan are wishlist items that would require legislation to pass through the City Council or through the State Legislature, like a “good neighbor” program to offer tax credits and other incentives as carrots to entice property owners to keep their units occupied. A proposed stick for that carrot is a “flip fee” to disincentivize property owners from selling off their stock too quickly, which would likely be met with strong resistance from real estate interests. But given the wide range of groups working on the plan, consensus remains elusive. Earlier this year, a schism erupted between City Planning and the residents working on the community plan, a split that is noted briefly in the plan itself; additionally, activist groups have come to the fore in outright opposition to a rezoning plan. Among the groups opposing the rezoning are Mi Casa No Es Su Casa, G-REBLS and the Brooklyn Anti-Gentrification Network. Longtime Bushwick resident Pati Rodriguez of Mi Casa No Es Su Casa, which recently disrupted a CB4 meeting where the steering committee presented the plan, said there’s little reason to trust that Mayor Bill de Blasio and other city leaders will follow through on the plan’s recommendations. Residents should put the rezoning aside, she said, and push for other recommendations in the plan that are needed for the neighborhood. “It could be the best plan, but at the end of the day the city will decide what it wants,” Rodriguez said. Rodriguez said that, despite the appearance of wide support for the plan from neighborhood groups, many of the residents she has spoken with in recent months were unaware that there were talks of rezoning Bushwick. And as for capping building heights on side streets, the opponents say the restrictions themselves wouldn’t keep developers from turning more of Bushwick’s virtually ubiquitous three-story row houses into luxury units. “It doesn’t need to be a tower to be luxury housing,” said Ariella of G-REBLS, who declined to give her last name. Another sticking point concerns rezoning manufacturing sites on Flushing Avenue, the northern border of the neighborhood and close to the massive housing development on the former Rheingold Brewery site, for high-density residential development. City planners argued that those sites should be included in the mass rezoning, which would be subject to one run through the city’s Uniform Land Use Review Procedure, while community plan architects argued that the manufacturing zoning should be maintained and that rezoning them should be subject to separate ULURPs. Moving forward, the steering committee for the plan will reconvene to pore over the plan and prioritize which recommendations can move forward first, said Asher Freeman, Reynoso’s legislative and land use director. But many key recommendations, Freeman said, including those for affordable housing and economic development, are tied to the rezoning plan. An environmental impact study must be completed for the plan, he said, which usually takes around eight months. City Planning is expected to certify a rezoning application for the ULURP process that won’t take all of Bushwick residents’ asks into consideration, Freeman said, but the competing visions for the neighbrohood-wide rezoning will likely come closer together through negotiations as the application reaches the City Council. Ultimately, a rezoning request for the neighborhood must go through Reynoso and Espinal, who pledge that they won’t sign off on anything that doesn’t have community support; in practice, the City Council will not sign off on a proposal if it falls under the jurisdiction of a council member who doesn’t support it. “We know that, if no rezoning recommendations are carried out, the current rate of development will be destructive for the community; as many as 7,000 market-rate housing units could be built without the construction of a single affordable unit,” the plan warns. Andrew Denney, a Bushwick resident who originally hails from Missouri, is a staff writer for the New York Law Journal, focusing on litigation in New York’s state and federal courts.